St. Margaret’s Church, Polmadie, Glasgow. May 2008. 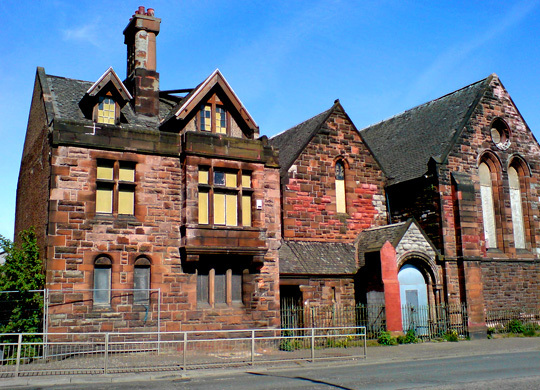 The inner-city Glaswegian neighbourhood of Oatlands is situated on the city’s southside, immediately east of the Gorbals. I first ventured into this part of town one late spring day, on one of those rare occasions when Glasgow’s weather was fine and warm, and I desperately needed a break from my desk. The decision to walk to Oatlands was entirely arbitrary. Not really knowing the neighbourhoods around Govanhill that well, I scanned my A-Z for possible signs of inspiration. To the east of my current position lay an industrial landscape, represented on my map by an array of cartographic hieroglyphs. Orderly arrangements of geometric shapes indicated factories and power plants, and anonymous blank spaces denoted railway sidings. Exploring an industrial estate was all very well, but it hardly seemed an appropriate activity for such unaccustomed favourable weather as this. Studying my map, I spied a single colourful jewel, an emerald of green, amid this landscape likely to be dominated by concrete greys and depot browns: Richmond Park. Here was my target, an oasis of parkland in an otherwise industrial landscape. From my front door I head onto Calder Street, before turning into Polmadie Road. Very quickly the surroundings change, from the residential red sandstone tenements that prevail in Govanhill, to a combination of equally Victorian, red brick commercial buildings and rather uninspiring, modern flat-packed industrial units. As the map had indicated, there are few signs of residential land use along this road. But as I turn a corner, I come across a fascinating turn-of-the-century church, which punctuates an otherwise mundane streetscape. It is a charming and diminutive Victorian creation, built from red sandstone, and adjoined to which is presumably the former rectory. I say former, because all of the church and rectory windows are boarded up, and their entrances blockaded by metal railings. Right now, there is little more I can deduce from looking at the church itself, but one thing becomes clear: at some point in the past, there must have been a community here. What, I wonder, happened to this area’s churchgoers? As I press forwards, it becomes clear that St. Margaret’s is not the only evidence of this area’s former community. On both sides of the road, the decline of this neighbourhood, and efforts to rebuild and renew it, become increasingly apparent. I begin to build an incomplete picture of a densely populated neighbourhood, whose inhabitants resided in traditional stone tenements, amongst a landscape of industrial works. The reasons for the area’s rapid decline are not immediately obvious, but one suspects that it is the usual story of postwar decline: a dramatic drop in manufacturing output and subsequent economic failure, coupled with poor housing conditions which prompted council intervention in the form of regeneration, rehousing in modern blocks, and systematic demolition of old housing stock. One can extrapolate the narrative further: a failure of those postwar attempts at regeneration, prompting further waves of relocation and demolition. Tenement housing, Oatlands, Glasgow. May 2008. A little further down the road, I find evidence that corroborates some my speculative impressions. Now, on either side of the road are vast and empty tracts of wasteland. Beyond the open space to my right, stand long rows of three-storey stone tenement buildings—not Victorian, possibly interwar—which stand empty. The windows of these housing blocks are boarded-up in a manner which reminds me of a Rachel Whiteread installation. On the open ground in front of the tenements, giant dumper trucks career past, carrying full loads of landfill from one place to another. On the opposite side of the road to my left, standing opposite the condemned blocks, a new housing development is being erected. Several identical blocks stand one behind the other, each one at a different stage of construction, creating a sort of slideshow illustrating modern building methods. These new blocks are steel-framed, multi-coloured boxes of grey and cream, with not a slab of Scottish sandstone in sight. Alongside, oversized billboards proclaim the impending availability of two-, three- and four-bedroomed flats and penthouse suites in these exclusive and luxury developments. Looking from the old and condemned, to the new and exalted, I find myself inexorably depressed. 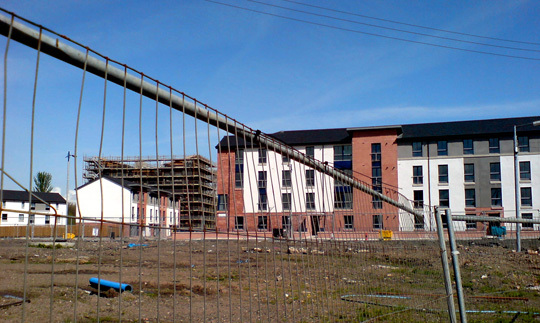 New housing, Oatlands, Glasgow. May 2008. A little further along the road, adjoining the new developments, is Richmond Park itself. I descend down a dozen or so steps, and find myself amongst the lush greenery of late May. The path ahead of me runs along the south bank of the Clyde, and as I walk onwards, I easily forget the renovation frenzy going on behind me. This would be a most tranquil setting if it weren’t for the fact that it strikes me as the kind of place that one might expect to encounter Glasgow’s drug users and Buckfast drinkers after dark. Glasgow Green is, after all, only a short walk away via a footbridge across the Clyde. But there is no one around for now, so I walk on further, underneath the burgeoning canopies of trees and moist spring flora. Very soon, the dense woodland opens up into an area of sunlit parkland, at the centre of which lies an ornamental lake. A community of swans slide gracefully and silently across its water. The discovery of the lake acts as a jolt to my senses. It is almost absurd that such a site of popular recreation should stand amongst a seemingly depopulated and deserted landscape. But the park is further evidence of this area’s history. It is in essence a typical Victorian-era green space, and must have once stood at the heart of a bustling working-class community. One can imagine the labouring classes promenading in the park each Sunday, dressed in their best clothes, unconsciously mirroring the activities of the city’s better-off inhabitants, who themselves would have been strolling in the Botanical Gardens and Kelvingrove Park in the west end. But today, despite the clement weather, there is hardly anyone else here except myself. Again, the question runs through my mind: what happened to the people that lived here? According to Glasgow City Council, the Oatlands regeneration project began in 2005, and promises a mixture of both social and private housing, new community facilities, and the regeneration of Richmond Park. Less enticing perhaps, is the effect which the extension of the M74 motorway will have when it runs through the area. As I check my watch and turn to head back home, I cannot help but wonder what happened to the residents of Oatlands when the tenements were evacuated for demolition. I also wonder for whom the area’s new flats are intended. The new housing developments in Oatlands will inevitably produce a clean and attractive environment capable of enticing a new generation of urban dwellers, thanks to their proximity to Richmond Park and the Clyde. But what of the rupture created in such wholesale programmes of clearance and redevelopment? Where do a community’s residents go; what happens to their collective memory and identity, their sense of history and belonging. They will be irrevocably lost, replaced by a new urban landscape that has no connection to the past, and in which feelings of collectivity and community belonging have to be rebuilt from scratch. In the end, the only allusion to the bygone days of this area will be Richmond Park itself. This essay was originally posted in 2008, and has since been modified and updated.